Rock out! 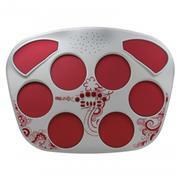 with your friends on the Sound x Electronic 8-Pad Drum Set powered by The Singing Machine. With a total of 16 sounds and 6 rhythms you can practice and be on your way to your dream of being a drummer! Drum Sticks & battery included. The Singing Machine is the leader in the home karaoke industry, bringing you the very best home karaoke has to offer for over 25 years. With an online music channel (store.singingmachine.com) and innovative new products, The Singing Machine is dedicated to fun, style and quality to keep you singing your favorite tunes.